David Miller serves as Vice President over Customer Strategy, Marketing and Brand Development for Buffalo Rock Company and brings over twenty years of experience in the beverage business. In 1994, David began his career in various areas of the company’s Birmingham division. Meanwhile, he graduated from The University of Alabama at Birmingham in 1999 with a Marketing degree. 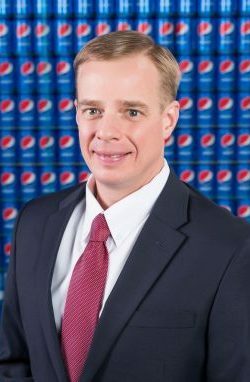 After graduation, he served as a Business Development Director at Corporate Headquarters where he served in this role for six years, before being moved to the Gadsden Division as a Franchise Sales Manager in 2006. During his two years in Gadsden, he oversaw the development and launch of the Talladega franchise. Shortly after, David was asked to assume the responsibility of General Manager in the Tuscumbia Division where he grew the franchise for six years. In 2013, David was asked to take a more expansive role in the company, being named General Manager of Marketing, Execution and Communication at Headquarters. David served in this capacity until 2015, when he was honored to join the Executive Leadership Team and was promoted to Executive General Manager. Presently, he is responsible for leading sales strategies and customer development across Buffalo Rock Company’s Retail, Full Line Vending and Outside Sales teams. David also leads the Marketing and Media initiatives, and Customer Finance and Administration. During his vast experience in the company’s franchises, David served in various positions for the United Way of Northwest Alabama and was named 2011 Campaign Chair, as well as, the President in 2012. He, also, was able to serve as a board member of The Healing Place. Currently, he serves on the Dr. Pepper Bottler Marketing Committee, the Pepsi Marketing Committee and has been selected for the University of Alabama at Birmingham’s Leadership Class of 2016. David and his wife, Michelle, reside in Birmingham with their 4 children. They enjoy spending time with the family, traveling, being outdoors, boating, water sports and hunting.